Venture Heat Grand Touring Deluxe Motorcycle Heated Jacket Liner is a dream come true for any motorcycle rider taking on the elements. The motorcycle heated jacket liner features an integrated wireless controller (sold separately) that easily mounts on a vehicle for simple and safe micro-climate control with 3 heat settings. The micro-alloy fiber heating elements are strategically placed around the entire back, around the collar, both sleeves and both sides of the chest for maximum heating performance. Its form-fitting design allows riders to replace their existing jacket liner while still maintaining high comfort and mobility levels. This lightweight mid-layer power sports heated jacket liner is weather resistant so it's safe to use in both snow and rain. 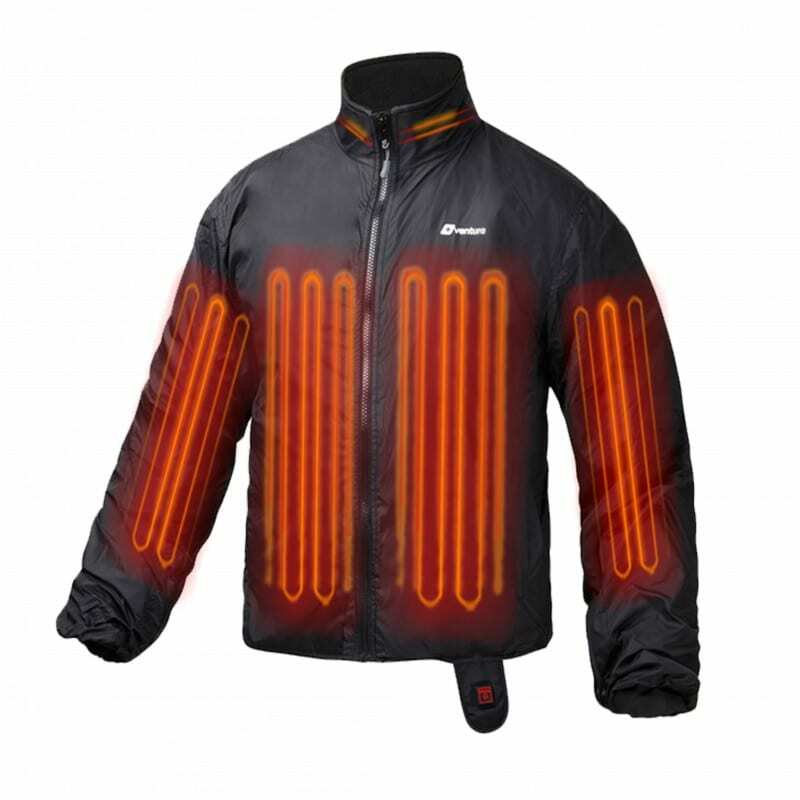 What makes Venture Heat Deluxe Motorcycle Heated Jacket Liner is the technology in the heating elements. These are made of, industry-leading, carbon fiber panels which can bend, twist and be folded without the risk of being damaged because they are wire free. The Jacket Liner also has built-in cables that run along the sleeve to allow any of Venture Heat’s 12V Heated Glove range to connect seamlessly to the one power source. The heated motorcycle gloves run off their own circuit which allows you to have completely different heat settings on the jacket liner and each individual glove to really customise your heat. Battery harness comes included so you have anything you need to stay warm on the bike. 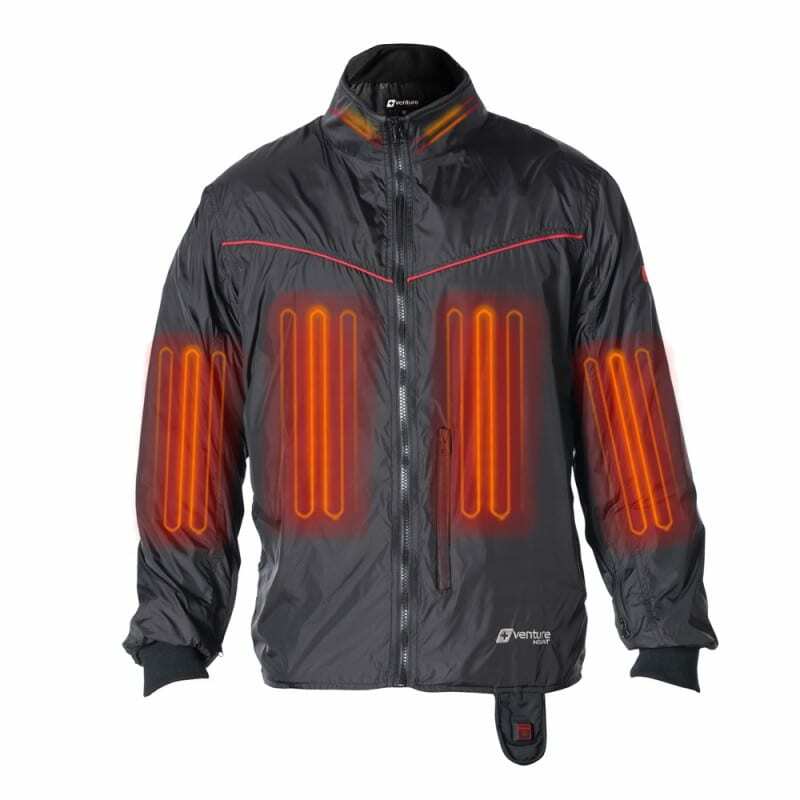 *Due to the number of heating panels the jacket liner has, it can not run off a portable rechargeable battery. The Deluxe Jacket Liner is like having an electric blanket wrapped around your upper body. You can now do what you love and ride your bike all year round in comfort. You wouldn't drive your car through the winter without a heater so why would you ride your bike without one. Ride all winter in comfort and use your bike as much as you do in the summertime. Add the pants, gloves and socks for full body heating.